Inducted into the chapter in 687.M41, Valerus was assigned to the 10th company as a scout. Over the next two decades, he proved an exceptionally aggressive and impatient warrior, repeatedly disciplined for abandoning his reconnaissance duties and initiating confrontations with the enemy. What prevented a fatal censure and his rejection as an Initiate was his repeated success on the battleground, a combination of martial skill and a ferocity unmatched in the chapter. Despite reservations by his scout sergeant, the highly regarded Argastas Kempon, regarding Valerus’ fitness to ascend to the ranks of full Space Marine, High Marshal Inoculus himself made the final decision to allow Valerus to undergo the final gene seed implantations and to be inducted into the chapter. His stated rationale was that Valerus’ aggression and ferocity would be more properly channeled by the more direct battlefield role of a tactical squad. And so it proved. Decades of distinguished service followed, with Valerus earning many honors for his battlefield exploits. The earlier reservations regarding his impatience were forgotten, and after the chapter suffered heavy losses in a decades-long battle to undermine the ork empire of Charadon, Valerus was commissioned a Brother-Sergeant. This promotion proved a disastrous mistake, as Varlerus’ lack of patience and discipline quickly reasserted itself once he possessed more control over his fate. He led his squad into ever-more dangerous combat situations, and some senior officers argued that this was leading to unnecessary losses among his fellow Battle-Brothers. Such talk wounded Valerus’ pride and led to increasing insubordination and conflict with his superiors. The doom of Valerus came in 726.M41 during a clash between the Imperium and Tau on the world of Hyberia II. 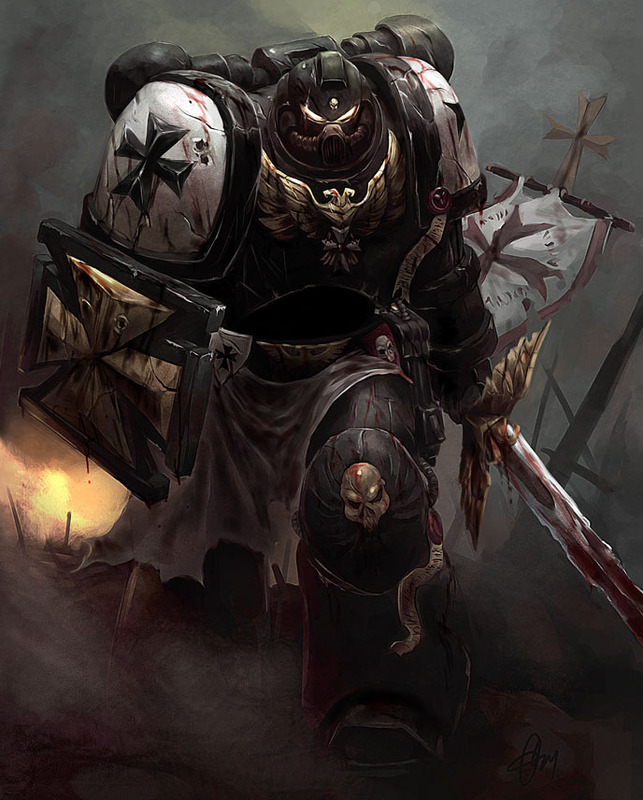 The Imperial Guard had suffered severe casualties on the southern flank of the Imperial line, and until reinforcements were brought up, the Knights were tasked with holding the front line, including assuming duties that normally would be a grievous insult to an Astartes. Thus Valerus found himself ordered to defend a forward repair base—a task the Brother-Sergeant considered an affront to his honor. His anger was so great that he was fatally distracted. Absorbed in his fury, he failed to maintain proper reconnaissance protocols for the surrounding area, and his command was unprepared when the Tau launched a sneak attack on his small detachment. Outnumbered 20-to-1, Valerus’ squad offered a stout defense but eventually was overrun. When Imperial forces finally arrived, they found the Tau had withdrawn, leaving most of Valerus’ squad dead or dying. Survivors praised Velarus for the ferocity in battle, but High Marshal Inoculus was incensed. After questioning the few survivors, Ioculus rebuked Valerus for his lack of vigilance, which the High Marshal blamed not only for the temporary loss of the Imperial base but for the unnecessary loss of life among the Battle-Brothers under Valerus’ command. Condemned for his failure, Ioculus passed judgment, sentencing Valrerus to the most horrific punishment possible for failing a fellow Battle-Brother. Taken away in chains, the Brother-Sergeant was allowed one month for penance and prayer, and then he was lobotomized and converted into a servitor. Today, the former Brother-Sergeant continues to serve his chapter—as a hulking, mindless transport worker who carries supplies from chapter vehicles to the front line. The looming presence of Velarus on the battlefield is a disturbing but constant reminder to every member of the Chapter of the dangers of pride and self-indulgent resentment. Only service to the Emperor matters. Prior to his defeat on Hyberia II, treat as a Veteran Sergeant, Tactical Squad, as per Codex: Space Marines. Afterwards, treat as a Servitor.